In a Concrete Batching Plant, most work-sites got several sets of Cement Silos to storage the cement. The cement was delivery by Bulk Cement Tuck , which has a Cement Pump on the Truck. But there are also many projects in some countries, which cement has to be Imported from other countries and was packaged in 50kg bags or 1000kg bags(Ton Bag). Then there is a problem , how can they put the Cement in Ton Bag into the Cement Silo ? UNIQUE has producing Concrete Processing equipment since 1960s, we are making a Special Ton Bag Breaker to solve this problem. 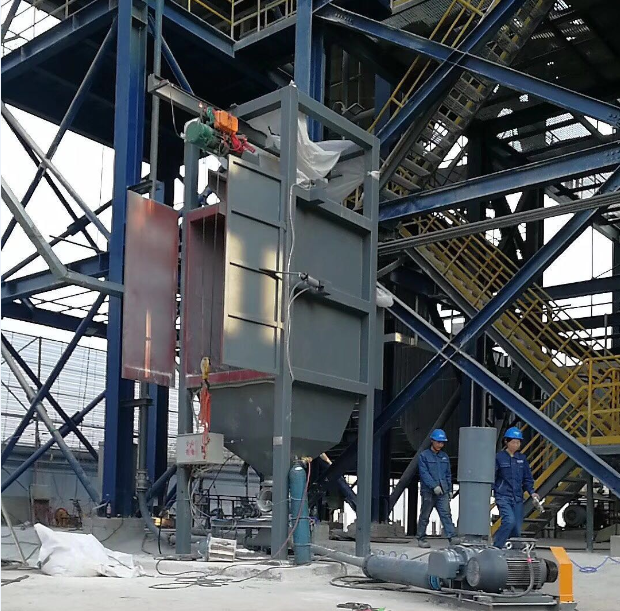 There is a Hoist up the breaker can hold the Ton Bags(1000~2000kg), and also with blades inside the breaker, Ton Bags was tear and get Bulk Cement , then with a Screw conveyor at bottom , Cement can be delivery to next process.. Like to a Bulk Cement Pump machine. Also can install a Dust Collector as optional parts for environmental protection.